If this was a translation patch, I would say to use the proper names for those, but as is it doesn't really fall into the scope of this patch. You're actually right, I'm going to revert it in that case. Oh, and the Kajar Shopkeep. I realize the R'bow Helm could use this, but you can only get it by charming. I would really feel bad for anyone who charmed a Rainbow off of a monster thinking it was something else, due to sharing names with the best weapon in the game. All that, gems, and reverted Rock Helm is in the Mega and submitted to RHDN. I'm thinking that this would be about the end of the line for item name changing... I can't really think of anything else to pick up. Which means outside of issues this could be it for a while. No, Stone Helm is correct. 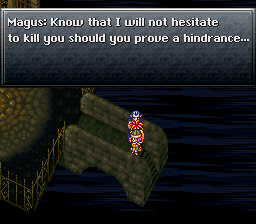 The part that wasn't correct was the belief that it was somehow tied to the Denadoro Helm in Chrono Cross. I agree with you, just Vanya had a good point. With the reference being non-existent we're mostly splitting hairs, which means in that case I default to the original due to the scope. Quick note: I've regulated Liberties Extended to add-on patches which can be put on top of the liberties versions, partially for space saving reasons and to reduce clutter as the changes are quite small between them. These should go exactly as they say on the tin (they are bps files so they'll tell you if you screwed up, I think), but if you're having any problems let me know. No one using non-liberties needs to repatch. I just wanted to chime in that the content I am most excited about you revising is the Olde English dialect for the inhabitants of 600AD. All the Chrono Trigger fans I've spoken to about this feel that it would be a huge improvement to the atmosphere of that era and I'm amazed that this has never been done over the various official releases. Btw, with all the hair splitting going on over equipment names, I thought I would add to the headaches and make a vote for Grandleon optionally replacing the Masamune--a weapon which has been a samurai sword in every other RPG I can think of and certainly should have been a Crono weapon for this game. Thanks again for the great work you are doing. Thank you! I've always tried to be really quick about fixing things (btw there's one in the queue that does another restoration in Bekkler's lab, I had totally not realized Piett earlier), my plan right now I think though is to take a small break outside of any other bugfixing that may come up. This is due to IRL, so I may just get started on the middle ages early after this. Come to think of it, with all the editing Frog's going to get Grandleon just might not be that hard to do since I'll be treading through the same events. The previous issues I would have with implimenting that are gone now. Experimentation with the addons went pretty well and everything being in BPS seems to help things out in that it'll tell you if patching went wrong, I could make it an optional patch to the new middle ages (I would never do this any other way being due to it reappearing after Trigger). It's been almost a month, I think it's time to take the cork off of the new middle ages. -Unlike the current setup, the new middle ages branch will be one main patch with most things contained. This will use Bugfix Alone as a base. -There will be addon BPS files which contain the variants I've made (which will need to be redone), name liberties etc.. The only big difference here is that SkyDark addons will contain shifting Masamune to Grandleon; given how focused I will be to every facet of the Masamune anyway, this seems like a good time to try it! -Concerning Magus and his generals: I'll be looking through their lines in the process since they are related, and if any changes are made these will be the only ones that concern the other patches. As for the script editing, they will recieve no added accents but the state of their mooks is unknown. I'm leaning heavily on not adding any accent to them too. I may attempt something a little more crass as they're monsters, but they also tend to be smart monsters so I do not really think this will fit either. Looks like a certain game got a Steam release. It is definitely a steam release, and that is all I'll be saying about it here. Say what you will about it, but of respect for Square-Enix (and out of slight paranoia, can you really blame me?) I will be lying low with CT for a while. I'm not quitting, just... waiting for the dust to clear. Say what you will about it, blut of respect for Square-Enix (and out of slight paranoia, can you really blame me?) I will be lying low with CT for a while. I'm not quitting, just... waiting for the dust to clear. I wouldn't worry about it too much; it's a lazy port with about as much effort put into it as was put into FF5 and 6 PC. ^I don't even know why SE even bothers with the half-a** ports. And before anyone says it, I know: money. But even you have to admit, is a crap job of a port. I dont mind, I didn’t want it taking the spotlight off of my project anyway. I realize this does sound like I'm being silly, but I'll still be working away in silence and I may not be gone for as long as you'd think. Look at it this way: longer time in the oven means it's better on release. I was referring to the pc port btw not this project. No worries Ben, I knew what you meant. -I will be taking two weeks of time from today. By then the rancor will have died down and journos will have stopped looking for things to promote. This is the extent of my respect for that thing. -At that time I will be pushing out v4. What this consists of will be mostly the results of me looking through Magus's lines (currently I'm putting my brain aournd North Cape), which as promised I planned to do. Not all will be changed, and the name of the game is keeping things in character. There will also be some changes in the SkyDark patches to Crono's spells to allow marking them as Sky. V5 will almost certainly be MSU-1 inclusion, because right now things are sitting pretty perfect. -NME Frog will be a different submission along with a news post (partially why I am so paranoid about this). All previous stuff still holds. I anticipate this to be a long runner due to me not wanting to rush what will probably be the biggest script change yet, and I will update on it's progress at the end of the month with hopefully some screenshots. -In his sidequest, he correctly states that he was doing a power grab. This is folded in an added line with his other text, so all the rest is intact. Also the "it was all a dream" line is more descriptive. -In North Cape, he more correctly describes the easter egg of Frog's curse being gone if Magus is defeated in battle. The original text does reference it dispelling in time as opposed to just breaking immediately. I did NOT change the "Play with fire and get burned" line, however I did add some edge back to his insulting with a little help from how the DS version did it. Not completely that way, it's more of a compromise. -In the End of Time I have been so far admittedly quite minimal so far. Honestly the only change made wholesale was to the "Going my way?" line. The only other thing so far is that his line talking about cretins is kinda awkward like Nizbel Plus's was. I've reworded that slightly, and I'm going through those slowly. -On top of the Black Omen, Magus's special lines are tweaked a bit. -Bundled in will also be a change to Fiona's Forest, where dwelling beneath the earth or whatever will be simply underground. Small change, but given the earth stuff earlier I find it warranted. Oh, and slight edits to the Black Omen Entrance. There's also a bug fixed where in the Seat of Agelessness, there are indents in a line. EDIT: I found a bug with the SkyDark+Name Liberties version that is kind of a big deal, so this may be coming sooner than I had said. Looks like V4 came out a bit earlier than I had mentioned. Actually a lot earlier, thanks to some bugfixes. -Spelling fix of Posess to Possess. -Fixed descriptions in SkyDark not always matching elements. -While I was at it, in SkyDark patches Lighting spells are now Thunder ones so I could update the descriptions to Sky. -Fixed an issue in the Black Omen where a string was indented. -In the Sunken Desert, the inner earth mentions are now all synced to Underground. -Minor updates to Ozzie's hideout and the Black Omen's Entrance. It's in the Mega and submitted to RHDN. So... enjoy me coming out of my very short haitus! I'll be making hotfixes when needed, but I doubt any will be necessary. V5 either way will be the end of the road for this one, as there I plan for that to be the MSU-1 update. The screenshots I’ve promised are probably not going to happen. Real Life™ has crept in to delay things by a large margin, so I’ve had no choice but to wait on that for something tangible. You may in the meantime expect me to address the prehistoric party at some point. It's been brought to my attention more than once that there is a small element I need to attend to, and I haven't gotten to my thoughts over that multichoice yet. Oh yes, partially in response to something brought up to me earlier: if anyone would like to do a script more attuned to the DS version or using more elements from it, they may use my patches as a base with my blessing. Using them you'd probably only have text insertion and the Light graphic left depending on what you want to do, so I feel it would be a nice base to jump off of. I do realize that Bugfix doesn't completely attend to those who would like something more along the lines of it (I do try to adhere to the fact that the title still reads "bugfix" after all), I don't really think time is on my side for creating a fixed up DS script, and the script dumps I'm using are less-than-nice enough for it. -The Dornio Inn man is now drowning his sorrows. Living it up had the same intent so I didn't deal with this in the first pass, buuuut I made a judgement call here and this is better. These people are expecting the worst after all. -I did however, keep the clear your conscience thing. The nun is to call someone to pray because the apocalypse is coming, and honestly as someone who comes from a huge church community being raised around end of the world calls I realize this has the same intent. I've heard both. -After the prehistoric party, Ayla now says she drank too much Rock Crash. I had originally kept the eating part in first pass because she talks about both eating and drinking. After restoring Rock Crash though this is much more inconsistent. -Currently I'm looking into the future "lab" locations. The DS version has these listed as "sites." Honestly though, since the script and chapter name call them ruins I think these should be named ruins. This includes Doan, as his Lab mention was capitalized wrong anyway. Will we need to create a new save file for the leap from v4 to v5? EDIT: I gave all the patches a quick spin through ucon64, including the addons. That should do it. I predict that v5 will not break saves. I heavily doubt that will ever happen again. The issue from old to new last time when saves broke was because of CronoNick being standard through all patches, that component basically puts a little bit of data into save files that anything using Crono's Nickname reads from. Okay cool. Good to know I can start playing now then. Do you know what kind of conflicts may happen If I try to apply a patch on top of yours to have MSU-1 support? I know that it's a feature coming in the next version, but I'm wondering if it's as easy as I'm making it out to be. I ask because I'm practically all set up to play with the Chrono Symphony music. So let me get this straight here. We can patch and play the ROM as you're creating the patches? Am I understanding this correctly? As for MSU-1 alone, I'll have to get back to you. There may not be any conflicts. With the FMVs it just plain conflicts completely becasue the events are altered to make the FMV cues happen. Almost every single grain of text has been touched by my patches due to the alignment stuff, so it overwrites absolutely everywhere. This is also why Coliseum and the like aren't compatible. You're good to go with things I've made up onwards, the only huge thing I have planned is FMV support. In the eventual point new middle ages are implimented, you should even be able to swap saves into there. My warning in the patches' description is about way back when this was an addendum, which is why the patch numbers on RHDN say "rebuilt." You don't need to fear about save breaking as long as you have that name on the version number (and don't use a save from vanilla after Mystic Mountain). I should probably edit the hack description to be more clear about this. Currently playing with an MSU-1 patch. Doesn't seem to be any issues so far. Also I found a typo. One of the dudes in Trann Dome mentions Lab 16 instead of Ruin 16. He says this even without MSU-1 patch applied. Okay so playing with both patches in bsnes will cause a black screen after Crono's mother tells him to wake up. This does not happen in Snes9x, though Snes9x makes it so the msu-1 audio doesn't resume after a battle no matter what msu-1 patch is applied. I'm using RetroArch to play, if that matters.